George Graham Reviews Heidi Talbot's "In Love and Light"
The Celtic scene has spawned a lot of music along the peripheries of the style, not exactly traditional but with the sonic and stylistic elements of the genre. With performers ranging from the eclectic traditional group Solas to the new age sounds of Enya, the Celtic scene has become rather wide-ranging. This week we have another recording that expands on Celtic music, it's by Heidi Talbot and it's called In Love and Light. 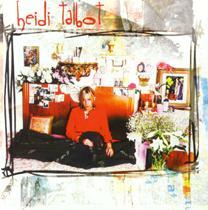 Heidi Talbot is probably best known to Celtic music fans for the years she spent as lead singer in popular the Irish-American band Cherish the Ladies. She's an Irish native, from County Kildare, whose mother ran the local church choir. The middle of nine children, she says that in growing up, she heard a lot of different music from her parents and siblings, from Dolly Parton to Gun 'n' Roses. She naturally gravitated toward singing, to the point that she was getting in trouble in school for missing days after playing a gig the night before. After high school, she enrolled in a vocal school in Dublin, studying under the same teacher as Sinead O'Connor. At age 18, more or less on a lark, she and one of her brothers decided to move to New York with a thousand dollars between them. Through good fortune, Ms. Talbot was able to land a job singing in a wedding band within three days, a job she continued for some 18 months, before striking out on her own. In 2002, after Cherish the Ladies founding lead singer left the group, Ms. Talbot was invited to join, and she was with them for some five years. In 2005, while still with Cherish the Ladies, Ms. Talbot moved back to Ireland, and then to Edinburgh, Scotland. Transatlantic commuting to perform with Cherish the Ladies and an accumulation of her own material led Ms. Talbot to decided to leave the group in 2007, on amicable terms. During that time, she recorded a couple of albums, including one, Distant Future, that had American distribution. One of her collaborators on that CD was guitarist extraordinaire John Doyle, a founding member of Solas. Doyle also appears on the new CD, In Love and Light, though the producer this time is Boo Hewerdine, a British musician who once headed a fine band called The Bible. The new recording is rather wide-ranging, including material running from a traditional Scottish ballad to a Tom Waits composition to a Tin Pan Alley song made famous by the Mills Brothers, to a traditional Appalachian old-timey tune. Ms. Talbot does not contribute any songs herself, but there are two by Hewardine, the producer. She is joined by an impressive group of collaborators, including Doyle and Hewardine, along with Ewan Vernal and Donald Shaw from the band Capercaillie, and John McCusker from the Battlefield Band. Also Eddi Reader, formerly of Fairground Attraction makes an appearance on backing vocals, along with Orkney Island singer-songwriter Kris Drever. These are some of the people who have also appeared on recent recordings by the English singer Kate Rusby, and indeed Ms. Talbots music and her vocals can be reminiscent of Ms. Rusby's which in my book, is quite a good thing. In Time and Light the new recording by Irish-born singer Heidi Talbot is a fine CD from a very appealing singer who brings a touch of Celtic influence to the wide range of material she takes on here. Her style to some extent recalls that of Kate Rusby, and that may be because some of the musicians who are regulars on Ms. Rusby's recordings are also present on this one. Ms. Talbot's almost angelic voice is a pleasure to behold, and the backing musicians add a lot of class. Our grade for sound quality is an "A-minus." There is good clarity and an absence of needless studio effects, but the dynamic range, how the recording differentiates between loud and soft passages, is mediocre. If you are interested in more traditional Celtic music, it's not hard to find it performed by a new generation of up-and-coming groups. But music on the periphery of Celtic, or drawing on the influence of the style, is also proliferating, and Heidi Talbot represents some of the best in this musical hybrid.